Three years in, the Baylor Research and Innovation Collaborative (BRIC) is doing what it was meant to do. The cornerstone facility of the developing Central Texas Technology and Research Park, previously described only in terms of future possibilities, is now a functioning reality. With over 300,000 square feet of physical space, the BRIC contains labs, research centers, and industry and workforce training collaborative space. An incubator for progress, the BRIC houses tenants who often collaborate to take advantage of the expertise and networking connections in the building. 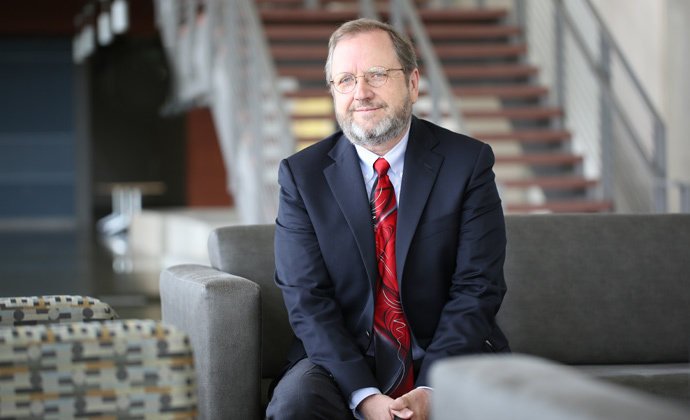 Researchers associated with Baylor University, CEOs of local high-technology companies, start-up businesses and employees of one of the most advanced international aerospace corporations need only walk down the hallway to discuss the latest advances in their work. David Jack Associate Professor, Mechanical Engineering, Baylor School of Engineering and Computer Science. 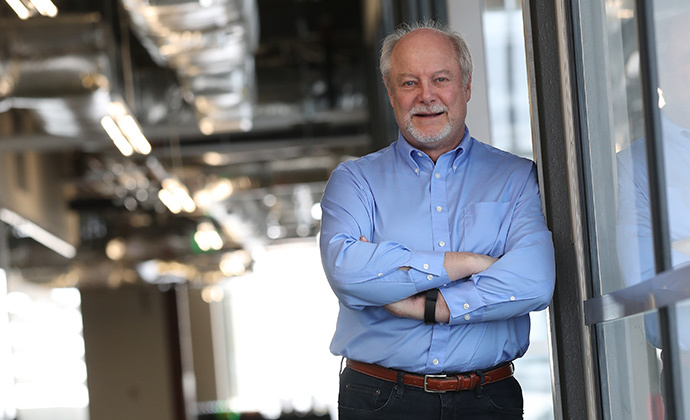 More than a dozen undergraduate and graduate students have worked on research projects alongside Jack in his BRIC lab, including the efforts that led to the first patent application from the BRIC. The BRIC places many of Baylor’s most accomplished scientists and engineers in a distinctive collaborative environment, rich in resources and primed for incisive innovation in quantum optics; space physics cosmology; and mechanical, electrical and computer engineering, ranging from the biomedical, geospatial and environmental sciences; and beyond. The BRIC adds another practical dimension to discovery by bringing these and other highly sought support resources within easy grasp of entrepreneurs, businesses and industries whose very survival depends on timely innovation. 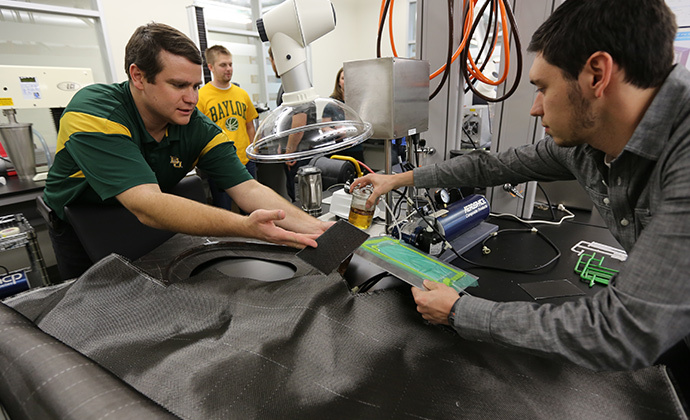 The collaborative nature of the BRIC has created a unique, synergistic partnership in an aerospace cluster—bringing together Baylor research in mechanical engineering, local and international industries and an emergent workforce of trained technicians from Waco’s Texas State Technical College (TSTC). One embodiment of the BRIC’s success in this realm is a patent-pending detector system. The research, development and soon-to-be certification and commercialization of this technology—all under one roof—is unprecedented. The distinct environment at the BRIC has contributed to the development of the detector system from industry need to nearly fully productized system, which will forge new possibilities for the non-destructive testing of composite materials for airplanes. 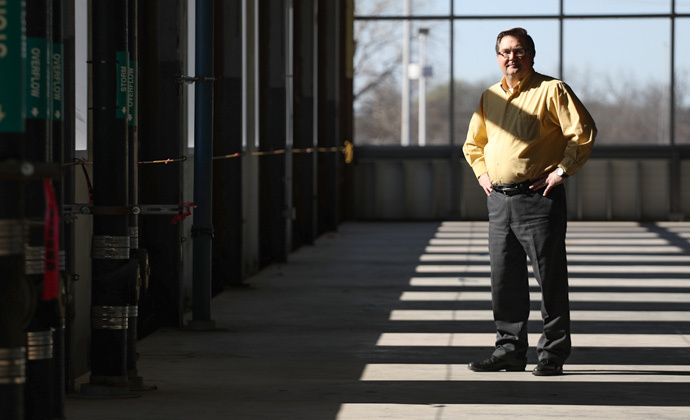 Years before the BRIC was brick and mortar, L3 Platform Integration—an international aerospace corporation with a site in Waco—posed a research question to Dr. David Jack, mechanical engineering professor at Baylor. The industry was switching from aluminum to composite materials as the primary structural component in its aerospace construction, and L3 needed a reliable, non-destructive way to assess whether the composite parts had been made flawlessly. According to Jack, options for testing composite materials were then—and still are—extremely limited. Most companies rely on destructive testing, which requires burning or breaking the materials to check for structural damage. This is a crude test and not a viable option to examine the structural integrity on an entire airplane. Jack set out to discover “what’s going on inside” a composite without destroying the materials in the process. Over a dozen undergraduate and graduate students have worked on this project alongside Jack in his BRIC lab. Baylor researchers have created a solution for L3’s need by using ultrasound technology to build an internal, 3-D image of all the layers inside a composite at an extremely high resolution. A fundamental first step—and a mechanical engineering breakthrough—this project now rests on collaboration with small business tenants at the BRIC, which is vital to moving the technology from the lab to a useful device. A high-tech, locally owned small business started in 2009, Birkeland Current is developing the detector prototype into a marketable product. With offices in the BRIC roughly 300 feet down the hall from Jack and directly adjacent to L3, Birkeland Current has collaborated on the creation of the technology and is now putting together a business model to market the entire package—detector system, analytic software and trained technicians. Don Gillespie, Vice President of Engineering. Delta G Design, founded in 2004 and based in Waco, is a consulting and analysis firm for aircraft certification. Services include allowables testing, non-destructive and destructive monument testing, short-beam and long-beam testing, and reliability testing. Operating multiple test platforms with a wide variety of data aquisition equipment, Delta G Design has designated engineering representatives (DER) on staff to help provide testing solutions. For the detector system to be successful in the market, it must be certified by the FAA. Once again, the BRIC proves to be the epitome of synergy. One floor up, Don Gillespie of Delta G is preparing the necessary paperwork to observe the certification process in-house. This will save thousands of dollars and hours of packing and loading equipment and driving to the nearest FAA certification location in Fort Worth. Perhaps the final piece to this robust technology package will emerge from TSTC—the state’s workforce development institution. The two-year technical college designs and delivers training elements that are in demand for business and research. Several TSTC graduates work in BRIC labs, and the opportunities are ripe for continued expansion and growth. 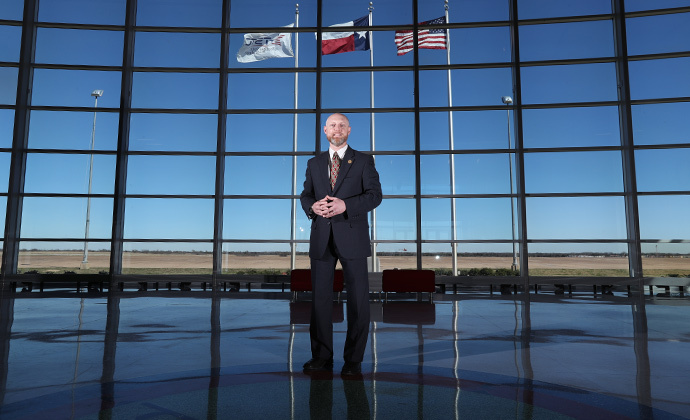 Adam Hutchison, TSTC Provost. Texas State Technical College was estabished 50 years ago with the aim to help Texas meet the high-tech challenges of today's global economy, in partnership with business and industry, government agencies and other educational institutions. Whether a student is considering upgrading their skills, or just starting out on a new career path, TSTC prepares graduates for great-paying jobs in the vibrant Texas economy. With a tremendous amount of engineering expertise, Waco is at the heart of the I-35 “research corridor.” Major infrastructure pieces intersect with the location of the BRIC, which is situated equidistant from East Coast to West Coast, on a major rail hub, close to TSTC’s airport and directly off I-35. Additionally, approximately 80 percent of Texas’ population is within 200 miles of Waco. The launch of a fully productized detector system could change the “little known” element as it exists today. Fitch says a fully mature product will include an FAA-certified detector system with a software package, complete with analytics and certified technicians to run the system. Project leads intend to have the FAA certification completed by the end of July with the business model to potentially start up a services company by the end of the year. The detector system is only one project of many underway within the BRIC. Successful collaborations are also producing tangible results within and beyond its walls. Stuents at Spring Valley Elementary School in Hewitt, Texas, will soon use modular, flexible learning space arrangements—designed and tested in the BRIC—to enhance their learning experiences in the classroom. The Center for Astrophysics, Space Physics and Engineering Research (CASPER), Baylor School of Education, the Education Service Center Region 12 and Huckabee, an architecture and design firm, worked together in space within the BRIC to develop furnishings, using teacher input to facilitate quick reconfigurations of seating and work surfaces. Also located within the BRIC, the LAUNCH program continues to accelerate commercialization through small business start-ups. LAUNCH is an in-house bridge between research, product development and the marketplace, and a point of connection with the Central Texas community, associating with and cultivating new business and innovation locally. John Fitch, Owner, Co-Founder. Birekland Current is a privately held small business that specializes in disruptive technology research and development and in business and product development support services to help clients de-risk technology development decisions. Formed in 2009, the business works in the interfaces between science, engineering and business. The BRIC renovation transformed the long-vacant General Tire Plant, which ceased operation in 1986, into a hub of industry and progress. Within a facility that is architecturally appealing, functionally focused, environmentally friendly and conveniently located to all modes of commercial land-based and airborne transport, the BRIC provides researchers, industry and business clients, and regional institutions and organizations with hundreds of thousands of square feet of space designed and appointed for laboratories, prototyping and testing, offices and workspace, workforce training, business formation, development activities and meeting and symposium halls. Baylor researchers began occupying the BRIC in January 2013. In June of the same year, L3 signed a lease agreement to occupy 3,200 square feet of the building. For every job in a research park like the BRIC, scholars estimate another 2.5 jobs are created. These jobs are typically centered in emerging high-technology fields that ultimately enhance economic development of the local area and surrounding region. Hyde, a Baylor physics professor who also serves as director of CASPER, notes the BRIC convenes many disparate parts. Truell Hyde, Baylor Vice Provost for Research, Director of the Center for Astrophysics, Space Physics and Engineering Research (CASPER). 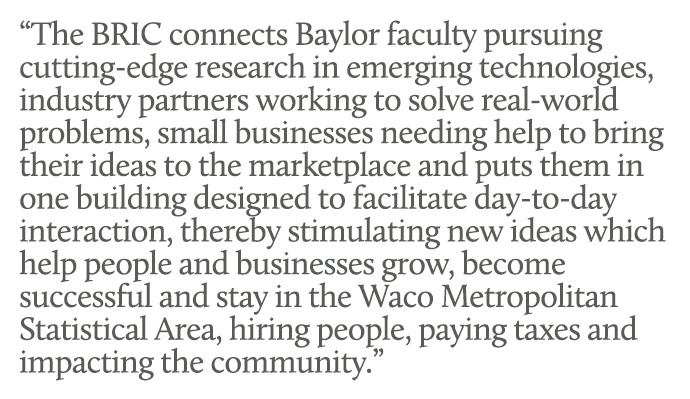 “The BRIC connects Baylor faculty pursuing cutting-edge research in emerging technologies, industry partners working to solve real-world problems, small businesses needing help to bring their ideas to the marketplace and puts them in one building designed to facilitate day-to-day interaction, thereby stimulating new ideas which help people and businesses grow, become successful and stay in the Waco Metropolitan Statistical Area, hiring people, paying taxes and impacting the community,” Hyde says. In recognition of this, local city and county governments, including the City of Waco, City of Bellmead and McLennan County; private foundations, including the Cooper Foundation; economic development interests, such as the Greater Waco Chamber and the Waco Foundation; and public and private institutions, including Baylor and TSTC, have been generous in supporting the design and construction of the BRIC. Three years ago, there was no functional lab to speak of in the building. Now, possibilities are becoming realities.